Many of you have probably already heard of Infinality, but I've decided to write a post about it anyway, for those who aren't familiar with it yet, because it greatly improves the font rendering on Linux. Infinality is a set of Freetype patches that try to provide an improved font rendering for Linux and also, to allow easy customization so the users can adjust the settings to their taste. Using it, you can easily set the font style to emulate OSX, OSX2, Windows 98, WIndows XP or Windows 7 or you can use the "Linux" or "Infinality" (default) styles. While Infinality is very useful for most Linux distributions, the Ubuntu font rendering is pretty good already, but even so, there are quite a few Ubuntu users who install Infinality, like Miroslav Hadzhiev (Мирослав Хаджиев), the Ubuntu Bulgarian Translators admin, who says that: "[...] this [Infinality] project has brought me back to Linux. I work with documents all day long so the fonts are VERY important to me". 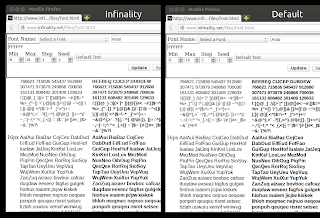 He adds that using Infinality, the fonts are sharper and more vivid on large screens - here's a screenshot from Miroslav's Ubuntu computer (on the left: Ubuntu default; on the right: Infinality with "Linux" style). Click HERE to zoom in so you can better see the details. The screenshot above uses the Linux Infinality style, but there are many other style you can choose from, as I was saying above. If you want to use or just try out Infinality, here's how to install it in Ubuntu and Debian (with links to installation instructions for other Linux distributions) and set it up. Debian: the PPA works on Debian 7 too (that's actually how I've installed Infinality in the screenshot above - I've used "raring" for the version), but because I've only tested it for a few minutes, I can't say how stable it is. If you want to use it in Debian, follow the instructions below on your own risk. An alternative way of installing Infinality on Debian can be found HERE. For another way of getting better fonts in Debian, see THIS article (it's in Spanish but you only need the commands). And select the style you want to use. Available options are: debug, infinality, linux, osx, osx2, win7, win98 and winxp (I recommend using the "linux" style, obviously, but you can try any style, then remember to log out and log back in - you can easily select a different style later on by using the same command). 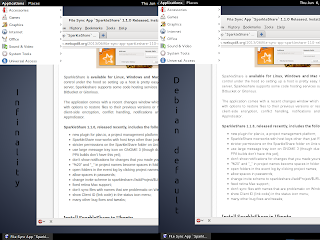 To use the Windows or OSX style you'll also need to use the Windows or OSX fonts. DISABLED - Act as though running without the extra infinality enhancements (just subpixel hinting). In this file you can change many other settings but if you don't know what they do, only change the style. Then, save the file, log out and log back in to see the changes. For discussion, bug reports and so, visit the Infinality forums. Once the PPA is purge, log out and log back in. Note: you also need to downgrade libfreetype6-dev if it's installed and also, libfreetype6:i386 may not be installed. You may want to check if those packages are installed by using "apt-cache policy" (example: "apt-cache policy libfreetype6-dev"). Thanks to Miroslav Hadzhiev for the tip and info and to "slow" for maintaining the PPA!